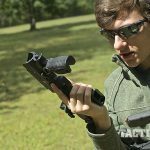 FAB Defense's KPOS adapters will transform your everyday Glock pistols into shoulder-mounted CQB contenders. Just like a rifle, the KPOS G1 carbine kit offers multiple points of contact with the shooter, which makes it particularly well suited for shooting on the move. It only takes a moment to install a Glock like this G17 Gen3 in the KPOS G1 kit, and it uses the same manual of arms as the host pistol. 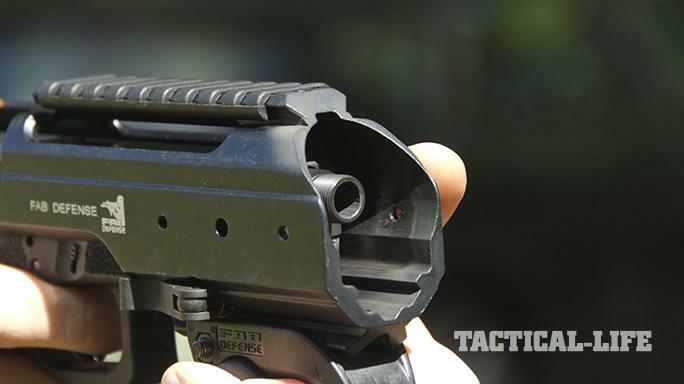 The sides of the KPOS are drilled and tapped for the addition of short rail segments, but if concealment is your game, you’ll want to leave these areas free of accessories. 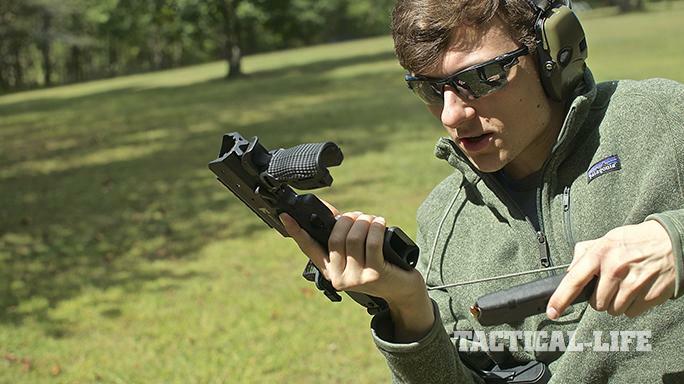 The author’s upgraded Glock 17 Gen3 sports a 5.03-inch 416R barrel with threading for a suppressor, and the KPOS effectively shrouds the muzzle. 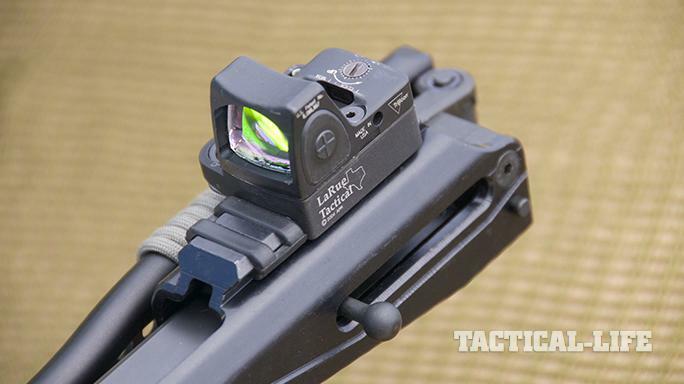 For fast targeting, the author mounted a small Trijicon RMR to the top rail. Also note the low-profile charging handle on the left side, just below the reflex sight. 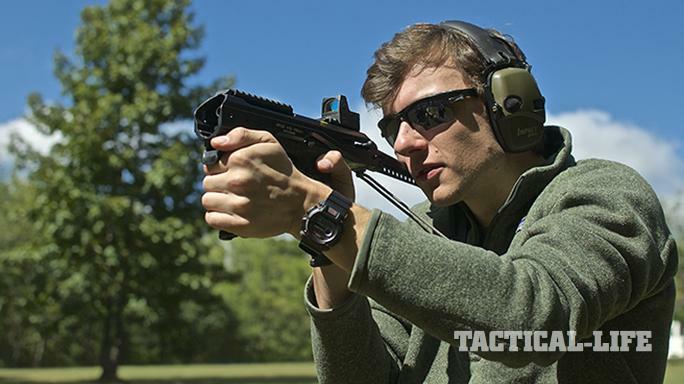 When deployed, the stock and foregrip offer extra control over a typical handgun. The author also uses a length of paracord as a makeshift sling. In this slick configuration, the KPOS-equipped G17 Gen3 can fit into most shoulder bags without drawing any undue attention to the operator. It’s also just as easy to run as a typical Glock pistol. I first tested the Fab Defense KPOS G1 in 2009. The KPOS comes in two versions, but I prefer the G1 for reasons I’ll cover later. 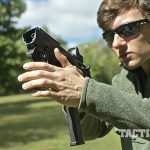 During my first experience with the KPOS carbine adapter for pistols, I found it capable, light, concealable and handy. However, at every turn, I argued that it couldn’t stand up to an AR-15. Because of that, I marginalized it. Admittedly, I was being an AR snob. But that was 2009. 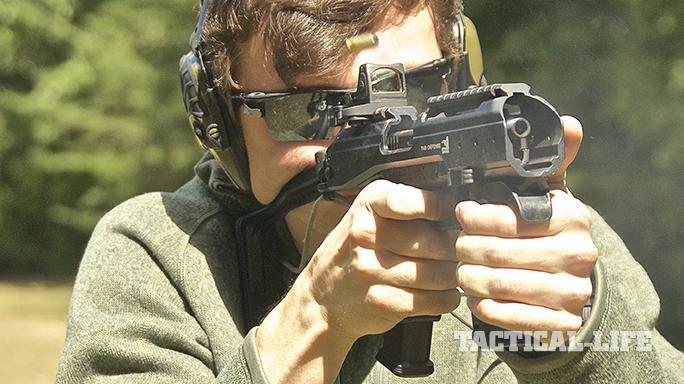 ARs were rising in popularity, and our nation was enjoying a burgeoning firearms industry. 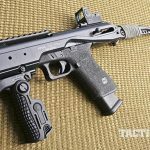 Recently, I picked up the KPOS again because I’d gone full circle fighting the limitations of AR-15s and personal-defense weapons, including size, weight, cost, proprietary parts and specialty ammunition. For me, one of the biggest reasons for owning firearms is having them nearby when needed. The best weapon for a fight is the one you have with you, so rifles are behind the eight ball in that regard. 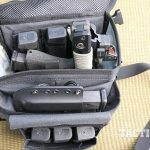 And attempting to conceal an AR-15 makes you stand out as “that guy.” The KPOS pistol-to-carbine kit, however, is so small that it conceals in the most innocuous bags. Although the KPOS isn’t as accurate as I’d like it to be, it’s far more accurate and fast recovering than a lone pistol. The best groups I’ve shot from 25 yards are about 1.5 inches, using JHPs from Federal and Black Hills. Groups of that size aren’t anything to get excited about, but I was able to achieve those in a quarter of the time I’d normally take with a pistol. That’s because the KPOS shoots like a rifle thanks to its multiple points of contact with the shooter. The KPOS is made from hardcoat anodized 6061-T6 aluminum. Various versions cover several pistol models, and this one covers the Glock 17 and G19. 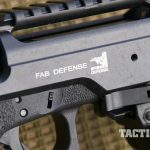 Fab Defense said the KPOS will accept Gen4 models, but during testing, I had several malfunctions with my G17 Gen4. However, my G17 Gen3 runs flawlessly. It pains me to say this, but the KPOS G1 runs better than the G2 version, and it’s also smaller. The reason behind the KPOS, at least for me, is its ability to create a true counter-terrorism weapon using a standard Glock with the least amount of hubbub. To slick down the KPOS, I removed the front cowling and stripped off the side rails. A weapon light isn’t crucial because of the mandate under which the KPOS is meant to be used. 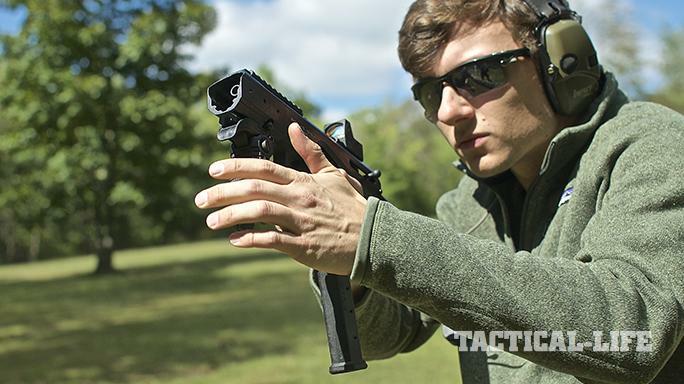 For most of us, this weapon is meant for the close-quarters environment of an active killer. If you’re a cop, your mandate is different. I’m not a cop anymore, and my concern with the KPOS is having it with me in the most concealable package. 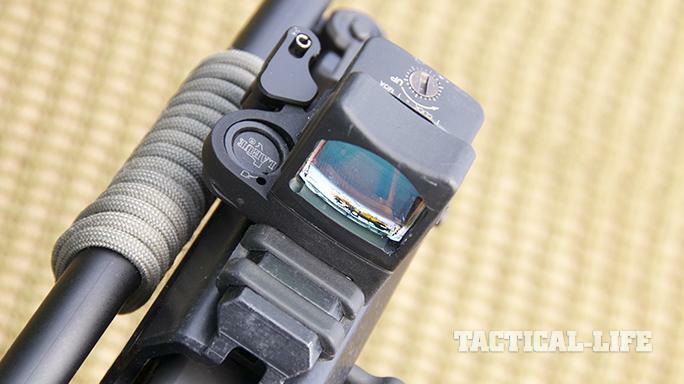 Mounting a light on its side rails creates a hang-up issue when it’s drawn from a small concealment bag. Active killers mainly strike during business hours in crowded places where lighting is not a concern. I did more than my share of time as a third-shift cop and have a hefty training file in low-light skills. Believe me, there’s always light somewhere. Further, a weapon light is a two-way street. Think on that for a moment. 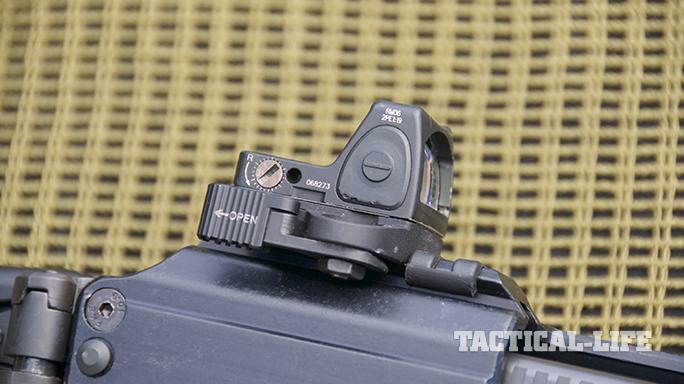 My optics choice was a Trijicon RMR06. 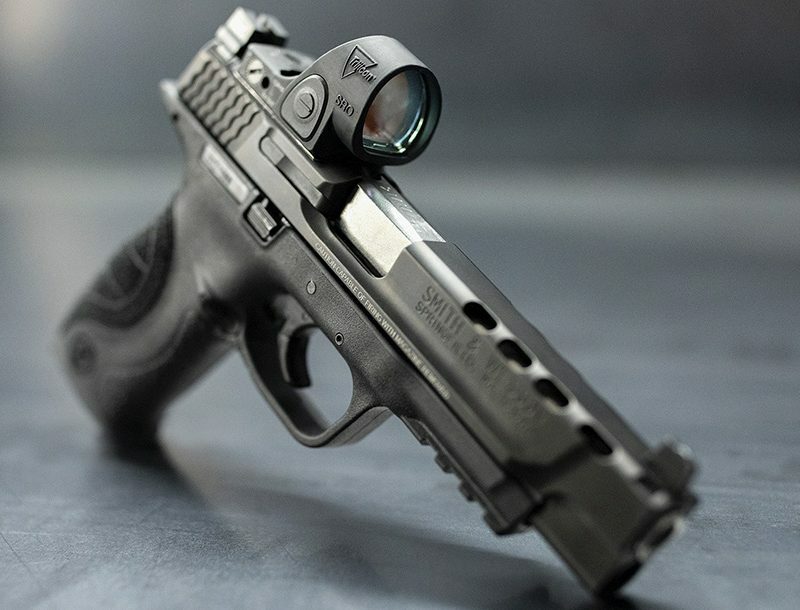 The RMR series has proven to be one of my favorites for high-backed weapons such as the KPOS. 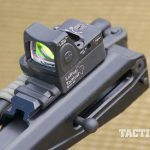 It mounts very low on the rail using the LaRue LT726 RMR QD Mount. 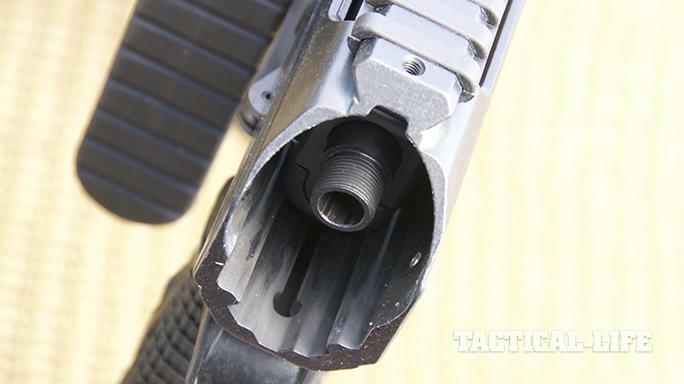 It’s low to the rail and keeps your mechanical offset to a minimum. 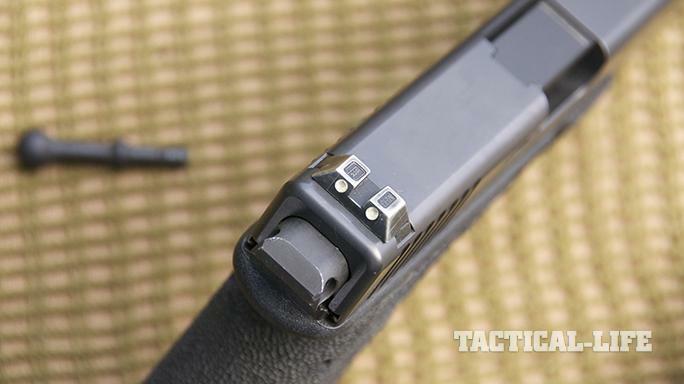 Charging the KPOS is accomplished by pulling back on the charging handle attached to the back of the Glock’s slide. 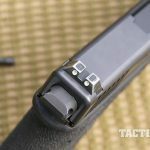 The Glock slide must be prepped by removing the takedown plate and replacing it with the one that comes with the KPOS. This plate is made of steel and has a charging handle that locks into a detent-captured slot that holds it securely in place. This handle is pushed in place after the Glock has been inserted into the KPOS. 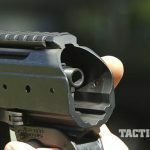 My initial impression of the KPOS was how effectively it erased my awareness of the “speed bump” that’s part of the take-up on a Glock trigger. I’ve always said shoulder-mounted weapons are forgiving and let you shoot well even with poor triggers. This forgiveness is because of the multiple points of contact on the weapon. The KPOS is no different. However, if you can do so, I’d change out your trigger for something better than the Glock OEM unit. 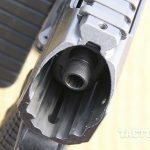 Even if you just change the connector with one from ZEV, you will dramatically change the trigger pull. That’s what I did with the host Glock, and it smoothed my ability to hold the trigger partially tensioned, then back off with a modicum of forgiveness that’s reminiscent of my Geissele SSA triggers. The zeroing process is frustrating with the KPOS unless you understand what’s occurring. 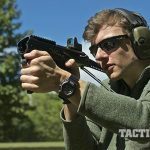 The KPOS isn’t a weapon—it’s an adapter—and as such, it has some wiggle room that can cost you accuracy. That’s OK because CQB doesn’t require a lot of pinpoint accuracy. When you hold the Glock in your shooting hand and put your hand on the forward grip, you are essentially grabbing two distinct things. 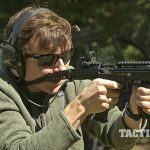 It’s unlike a rifle that’s rigid with metal-to-metal connections. The KPOS/Glock combo is metal to polymer and has a lot of give. 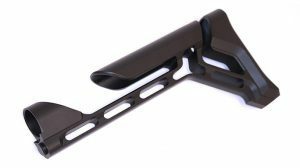 The KPOS holds onto the Glock by the accessory rail, with a slight amount of stability imparted by the back insert piece. 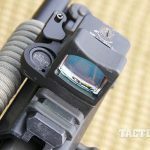 This means that optics and lights will slip in and out of zero based on how much movement there is between the KPOS and Glock. 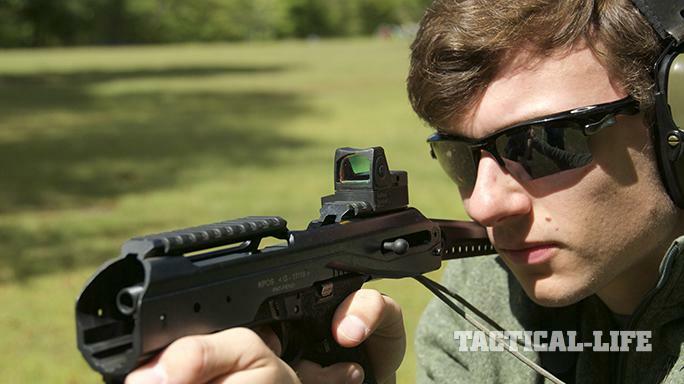 Another way to look at it is the Glock holds the KPOS, and the KPOS holds everything else. 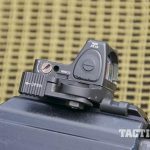 The entire KPOS is cantilevered off the accessory rail and makes the optic’s accuracy subject to how close to center the Glock returns after every shot. That’s why zeroing the KPOS is a bit tricky. You must be aware of how you’re going to hold it when shooting on the move as opposed to from a static position. When you impart force in any direction on the forward grip, you’re essentially taking the optic out of alignment with the barrel. That’s not crucial in close-quarters combat situations, where you’re working within feet of your adversary. However, you’ll suffer dramatic accuracy loss with anything farther than 25 yards. Let’s get back to center. 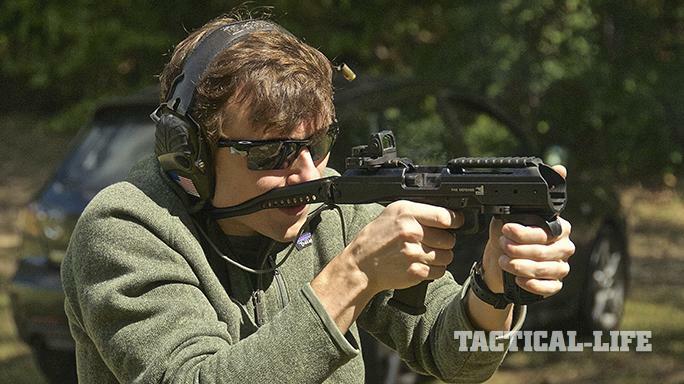 The KPOS is a CQB weapon that’s used throughout the world with great success. I’ve knocked over targets that are only 6 inches in diameter from 25 yards, so yes, it’s doable. Just know that you won’t be popping some guy in the eye from 25 yards like you can with a rifle. 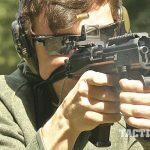 The KPOS is not a cheap way to tackle the problem of a small shoulder-mounted weapon. It runs about $500. However, you must consider that to get into a comparable weapon, such as an MP5K or TP9, you’re looking at about $2,500 for the weapon. Then you have to add the $200 NFA tax stamp, which puts you at $2,700. The KPOS, however, is $500, the Glock is $550 and the tax stamp is $200. 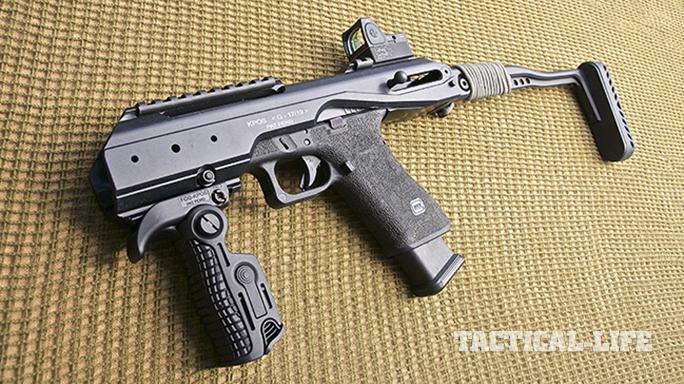 That has you out the door for $1,250—not a bad way to go if all you’re seeking is CQB accuracy. Also, consider that the KPOS is much lighter than any comparably sized weapon. 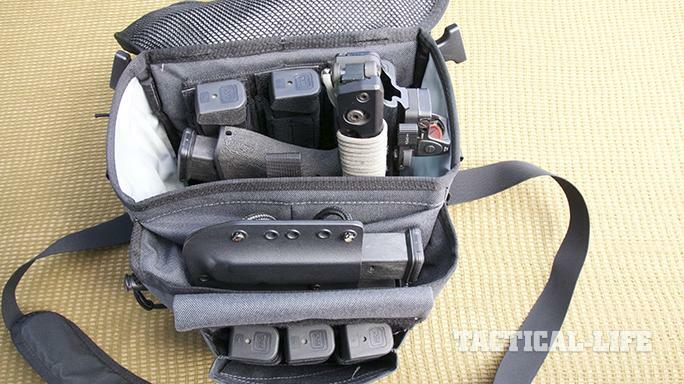 At about 3.5 pounds, you have a weapon you can conceal and transport as a daily-carry piece. Another consideration is that the Glock is stock everything. Its parts are easily accessible throughout the world. 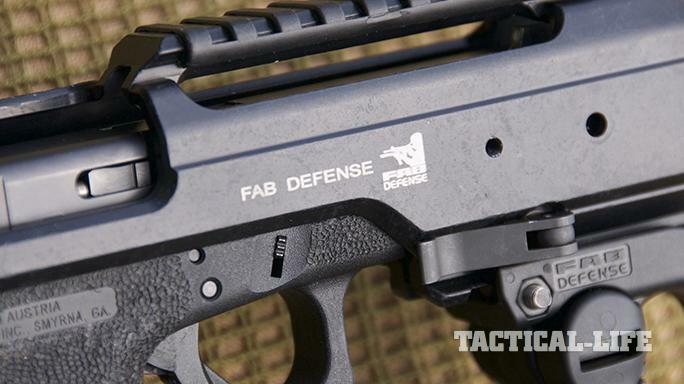 Consider any personal-defense weapon, including the recent crop of pistol-caliber ARs. If any of those weapons goes down, you’ll be fighting proprietary parts availability. The KPOS/Glock setup is stock OEM. It doesn’t matter if you’re in the Middle East or the middle of Zurich, Switzerland. You can easily find parts to repair both. 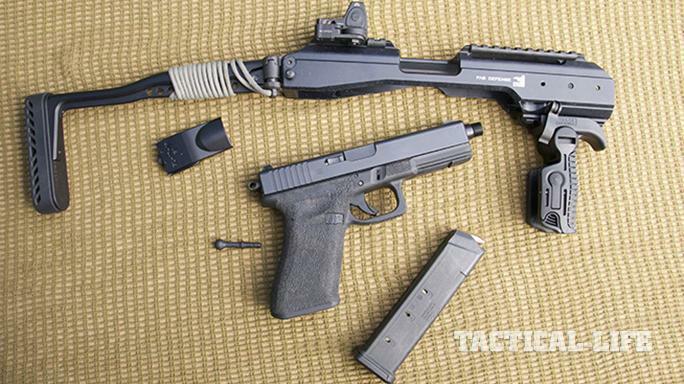 Also, Glocks can take on some nice trigger upgrades that rival anything available for personal- defense weapons. 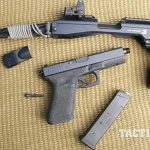 Glocks have been around a long time, which translates into a refined, highly supported product. I trained with Larry Vickers a few years ago. His military/law enforcement close-quarters combat course dramatically changed how I look at fighting in close quarters. The class was held at Blackwater, and in the shoothouses, we learned that close-quarters combat demands that you move efficiently and decisively. You don’t have time to find a perfect shot. All you’re seeking is a quick sight picture. When you’re moving around the confines of most structures, even a fast headshot is possible. The Israelis designed the KPOS so they wouldn’t have to create a whole new personal-defense weapon from the ground up. It’s a no-brainer to use what you have, and the Israel Defense Forces have lots of Glock 17s. I have almost 40 courses under my belt on everything from tactical medicine to tactical firearms training with pistols, rifles and shotguns. I’ve finally reached the point where I know what I know, and I even know some of what I don’t know. Now that I’ve come to appreciate the FAB Defense KPOS carbine kit for its genius, I hope I have opened your eyes to your Plan B. For more information, visit themakogroup.com. 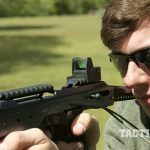 This article was originally published in “Tactical Weapons” May/June 2017. To order a copy, visit outdoorgroupstore.com.